Protesters have closed a Vodafone store in London's Oxford Street in a demonstration over an alleged unpaid £6bn tax bill. Vodafone has confirmed the shop will remain shut until it is safe to open it again. However, it disputes not paying a £6bn tax bill. 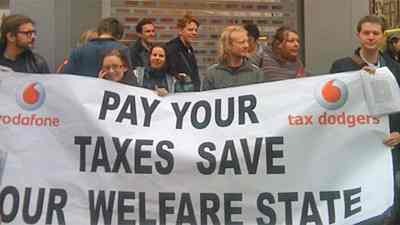 Activist Chris Coltrane, at the demonstration, tweeted: "Vodafone have dodged £6bn tax. That would have paid for almost all the welfare cuts. "We're shutting down their flagship store in protest." It is excellent to see private citizens taking tax dodging as seriously as we do. Hat tip: Chris Jordan, ActionAid. Update: the best story we've seen on this so far is from the New Statesman. Read it, and you get a sense of the anger out there.